UK Scout Jack Abrey, a first-year Geography student at Reading University, has recently embarked on an adventure with a difference – travelling to Madagascar with international charity WaterAid to help improve access to clean water and safe toilets across the country. 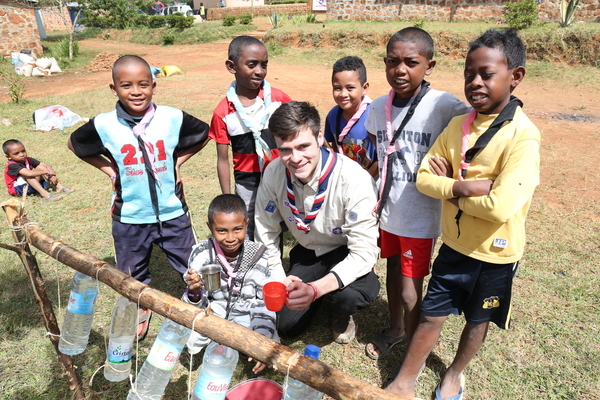 WaterAid works with the Scout Movement in Madagascar to campaign for water and toilets for all, and increase understanding of the importance of good hygiene among communities. 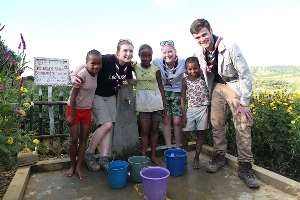 Jack, 19, and fellow Scouts Hannah Kentish and Becky Alexander, took the trip in conjunction with the ‘A Million Hands’ campaign to link with their Malagasy counterparts and see first-hand the impact of life without access to clean water and sanitation. They will share their eye-opening experiences with 65,000 Scouts from across the UK, who have committed to ensuring everyone everywhere has access to clean water and sanitation as part of A Million Hands. The trio camped with their fellow Malagasy Scouts, rising early for sports and ending the days around the campfire. They joined sessions on the importance of clean water, good sanitation and hygiene, and helped to build facilities at the camp, such as ‘tippy taps’ – a cheap way to wash hands where there is no tapped water. They also worked towards breaking down the taboos that shroud periods by joining discussions on menstrual hygiene and ways to educate others, even incorporating the subject into their campfire songs. The participants will use these activities with Scouts back in the UK to help them gain an understanding of these important issues. The young Brits also helped pass on the lifesaving messages to the wider community through performances and demonstrations at a ‘Dobodoboka’ – a type of festival organised by the Scouts with WaterAid on a busy market day. Jack saw why the work of WaterAid and the Scouts is so important when they visited Ambonidobo, a village that relies on dirty unsafe collected from a dirty pond. Lalasoa, 13, explained how she has to collect water twice a day, carrying 20 litres at a time up a treacherous hill. Jack added: “It was mind-blowing to see the changes clean water and good sanitation can bring. These basic resources are vital for a healthy and prosperous life, and I’m so proud that Scouts in the UK have chosen to take action on this important issue. Even by taking small actions, together we really can make a difference in poor communities in Madagascar and across the world. A Million Hands gives half a million Scouts the opportunity to keep their promise to help other people and take action on four social issues they feel strongly about. Keith Dunmall, Youth Engagement Manager at WaterAid, said: “It’s easy for us to take clean water and toilets for granted, but far too many young people in developing countries live without these basics, impacting on their health, dignity, and education. You can view a short video about their experiences here. The A Million Hands campaign is enlisting half a million Scouts to work with some of the UK’s biggest charities – Mind, The Alzheimer’s Society (Dementia Friends), WaterAid, Guide Dogs for the Blind and the Leonard Cheshire Disability Trust – over the next four years. Ensuring everyone everywhere has access to clean water and sanitation. Improving the lives of those affected by dementia. Improving the lives of those disabled by society. Improving the mental wellbeing and resilience of families. WaterAid’s vision is of a world where everyone has access to safe water and sanitation. 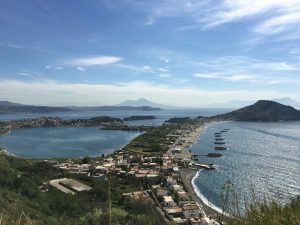 The international organisation works in 37 countries across Africa, Asia, Central America and the Pacific Region to transform lives by improving access to safe water, hygiene and sanitation in some of the world’s poorest communities. Since 1981, WaterAid has reached 23 million people with safe water and, since 2004, 21 million people with sanitation. For more information, visit www.wateraid.org, follow @WaterAidUK on Twitter, or visit us on Facebook at www.facebook.com/wateraid. Around 900 children die every day from diseases caused by dirty water and poor sanitation. The NSS results for 2013 have now been published! The results for Environmental Science are excellent, with 100% student satisfaction! We also scored 93% for academic support, and 98% for organisation and management.